It is never too early to start planning your summer gardens. Strawberries are a great addition to any garden in Calgary. Growing strawberries in Calgary is much more fruitful than it used to be. 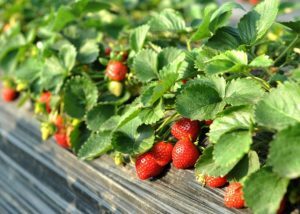 There was a time when growing strawberries in Calgary was difficult because there were very few hardy strawberry varieties to choose from but that has all changed in recent years. Thanks to new varieties primarily from Washington and the East Coast of Canada, hardy, bountiful strawberry varieties are now available. Older strawberry varieties like Tristar were ever bearing strawberries that would produce fruit throughout the summer. But the fruit form this variety was sparse with small berries and low yield. Now new varieties like Kent allow Calgary gardeners to enjoy June bearing strawberries. The Kent strawberry is a large juicy and very sweet berry that has excellent yield. Combining a June bearing strawberry with ever bearing strawberries is a great way to produce strawberries from June until October. Grow your strawberries in the ground or not? Strawberry gardening is not just limited to in ground plantings anymore. You can choose to grow strawberries in containers, hanging baskets or even in straw bales. The highest yield will likely still come from in ground or straw bales but if your growing area is restricted then container gardening is a great choice. If you are planning on creating a strawberry garden then don’t just plant single rows of plants. Instead, plant a single row and then allow the plants to runner. The runners are shoots that come off the mother plant and eventually these shoots become baby strawberry plants. You can train the runners by hand or hoe and place them in areas where the soil is open and the plants will have room to mature. Be careful not to cut the runners as these long stems provide nutrients to the baby strawberry plants. Once the runner plants take root they will start to create a wide row of strawberries. We recommend about a 2-3′ wide mat of plants for high yield. Wintering you strawberries correctly is very important especially in Calgary’s very cold climate. In the fall after the frost starts to hit your plantings you can start to cover them up for the winter. You can choose a variety of covers for the plants protection including wheat straw, leaves or mulch. Make sure you create a good think protective layer over top your strawberries of at least 8-12″. This protective covering will insure you have much less winter kill and a much greater yield of fruit come summer time. Your local Calgary will have a good selection of June bearing and overbearing strawberries plants. They are typically available in early May. Lots of snow is hard on the back but great for trees and shrubs! 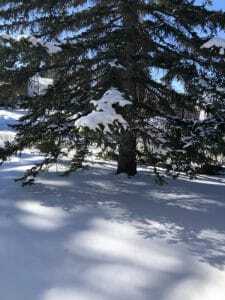 We all grow tired of shovelling snow during our long Calgary winter season but your trees and shrubs are happy as can be under all that white stuff!. Lots of snow can be hard on your back but its great for trees and shrubs. Clients often ask us if a heavy snowfall with be detrimental to their plantings. Calgary is famous for its warm chinook winds that blow in throughout the winter months. Temperatures can change by 20c in a matter of hours. This constant warming and thawing followed by freezing can be very hard on trees, shrubs and perennials. It can expose them to root damage if there is not enough snow fall. This is why a heavy snowfall and thick layer of snow over your plantings is a very positive thing and vital to your plant health. The more snow the better the protection will be to your plants. If you are running out of places to pile your snow then you could choose to pile it on top of your plantings to give them some help during the winter months. If the snow you are removing is mixed with salt then it is best to avoid putting it on top of plantings. The salt can damage the plants come spring time when the snow melts. If you have several feet of snow on top of your plantings then it would be helpful to move some of it once the very cold weather is over and spring is getting close. Leaving a foot or so on top your plants will ensure they are protected in case there is a last minute big freeze. Yardsmart and the Calgary horticultural Society. We wanted to let you know more about Yardsmart and the Calgary Horticultural society. The Calgary Horticultural Society is a place where horticulturists, amateur gardeners and anyone who is interested in gardening can meet to learn more about landscaping and gardening. They have weekly meetings, workshops, how to seminars on everything to do with horticulture and plants. Not only are they a great resource for homeowners interested in gardening but they are also a great place to network and meet other people who have similar interests. You can learn about planting trees and shrubs, , Plantings and lawn care and many more aspects of gardening in Calgary. Yardsmart and the Calgary Horticultural Society promotes organic gardening and water wise landscaping.